Available on Blu-ray & DVD September 12: po.st/BadNeighbours2Amazon Returning stars Seth Rogen, Zac Efron and Rose Byrne are joined by Chloë Grace Moretz for Bad Neighbours 2, the follow-up to 2014’s most popular original comedy. Also back in the same duties are director Nicholas Stoller and series producers Evan Goldberg, James Weaver and Rogen, who produce under their Point Grey Pictures banner. Andrew Jay Cohen and Brendan O’Brien serve as executive producers alongside Good Universe’s Nathan Kahane and Joe Drake. The comedy’s writers include Rogen, Stoller, Goldberg, Cohen and O’Brien. Yours to own on Blu-ray, DVD & Digital Download September 8. Order now: http://bit.ly/badneighbours14 www.badneighboursmovie.co.uk www.facebook.com/badneighboursmovieuk Go to war with next door in this outrageous comedy a comedy about a young couple who are forced to live next to a fraternity house after the birth of their new-born baby. starring Zac Efron, Seth Rogen and Rose Byrne like you’ve never seen them before. Don’t sit on the fence – Pick a side! TeamEfron vs. TeamRogen © 2014 Universal Studios. All Rights Reserved. Bad Neighbours is yours to own on Blu-ray, DVD & Digital Download September 8. Pre-order now: http://bit.ly/badneighbours14 www.badneighboursmovie.co.uk www.facebook.com/badneighboursmovieuk Seth Rogen, Zac Efron and Rose Byrne lead the cast of Bad Neighbours, a comedy about a young couple who are forced to live next to a fraternity house after the birth of their newborn baby. Yours to own on Blu-ray, DVD & Digital Download September 8. 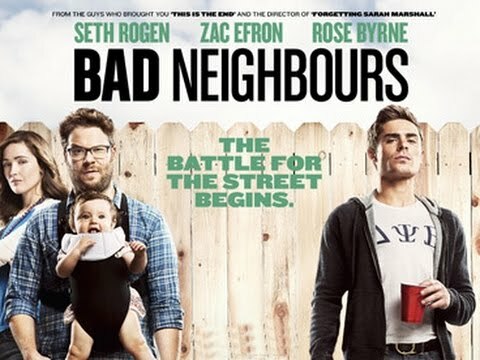 Order now: http://bit.ly/badneighbours14 www.badneighboursmovie.co.uk www.facebook.com/badneighboursmovieuk Seth Rogen, Zac Efron and Rose Byrne lead the cast of Bad Neighbours, a comedy about a young couple who are forced to live next to a fraternity house after the birth of their newborn baby.